The South Carolina State Library and the South Carolina Digital Library present the South Carolina Bookmobiles Collection, a collection of historical and contemporary images from the 1940s to the early 2000s. The photographs are from the archives of the South Carolina State Library and many were taken by State Library field agents. 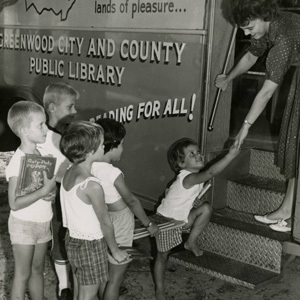 Portrayed in photographs are public library bookmobiles from across the state, featuring the bookmobiles themselves, library staff, patrons of all ages, and the collections housed in these mobile libraries.